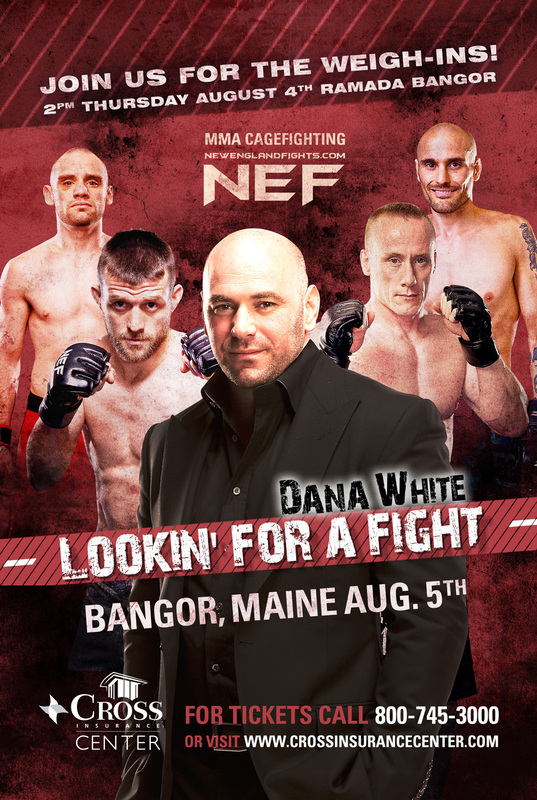 FOR IMMEDIATE RELEASE: Bangor, Maine (August 2, 2016) – New England Fights (NEF) will hold its next event, “NEF Presents Dana White: Lookin’ for a Fight,” this Friday, August 5, 2016 at the Cross Insurance Center in Bangor. The event will feature eight professional mixed-martial-arts (MMA) bouts and will be recorded for a future episode of UFC President Dana White’s new web series. Earlier today, the promotion announced that it would hold the event weigh-in this Thursday, August 4, 2016 at 2:00 pm EDT at the Bangor Ramada. The Ramada is located at 357 Odlin Road, Bangor, Maine 04401. Weigh-ins are open to the public and free to attend. All of the fighters competing on Friday night will be at the weigh-in. Fans and press are encouraged to attend. The Ramada will also host the official event after-party immediately following the show on Friday night. New England Fights’ next event, “NEF Presents Dana White: Lookin’ for a Fight” takes place this Friday, August 5, 2016 at the Cross Insurance Center in Bangor, Maine. Tickets are on sale now at www.CrossInsuranceCenter.com or by calling the box office at 800.745.3000.